The dissonance between the popular support at election rallies and the final count at the ballot boxes is evidence something is greatly amiss. Bashar was elected president with 97.29 percent of the votes, slightly less than the 99 percent his father regularly received to confirm his seven-year terms in office, but that is Syria. Asked to comment on the results, Reform Party's Jeyaratnam said the people deserved the government they are getting. The big question floating in the haze is whether the leader of the Workers' Party would do a Lee Siew Choh. Latter yanked his Barisan Sosialis out of the first post-independence general election in 1968, and allowed the People's Action Party to grab all 51 of the seats in Parliament. Why bother to give credence to the mockery of a democracy when a monopolistic oligarchy is actually in charge? The citizenry have other options, such as checking out the embassies to find out which country is better for the family they plan to raise. Making their way to Syria for military training is less attractive, the desert is far too hot for comfort. Or simply lie back and think of England Singapore, and the Swiss standard of living promised but will never be delivered. Bloggers should declare a moratorium in disgust. The gutter politician is at his tricks again. This time he is laying blame on Mark Zuckerberg. Vivian Balakrishnan is saying that a glitch with the well honed Facebook technology used by 1.18 billion people on the planet every month caused his election advertising first published on Sept 4 to be “auto-posting recurrently”. Although some spokesperson - notably not Balakrishnan himself - said the minister has explained to the Elections Department (ELD) about the potential breach of the "Cooling-off Day" law, it was Balakrishnan who claimed the "We have contacted Facebook headquarters to conduct an investigation into the source of this bug." There are some problems with the way the minister or his to-be-designated scapegoat is dealing with the transgression. First, they deleted the offending Facebook post, which makes it slightly more difficult for Facebook to examine the metadata. Secondly, the ELD is specific about election advertisements that were put up on the Internet which must be left unchanged once the campaign silence period kicks in at the stroke of midnight. Note also the use of technology to automatically deliver digital ads online and on social media platforms - such as "auto-posting recurrently" - should not be conducted on both Cooling-off Day and Polling Day. But the minister will not be losing sleep over the matter of whether electoral rules have been broken. If the Corrupt Practices Investigation Bureau (CPIB) has to get permission from the prime minister before initiating an investigation, would the ELD dare take action without consulting same? Out of desperation, some People's Action Party (PAP) supporter put into viral circulation a WhatsApp love-note ("Uncomfortable Questions") that ousted minister George Yeo (GY) categorically denied he ever penned. GY was/still is capable of misleading the public - recall he once said "But we are building integrated resorts, not casinos" - but this load of crap has to be composed by a juvenile. It's a waste of space to reprint the message, but fun to deconstruct the flawed arguments point by point. Point 1 raises the spectre of a "freak election" first mooted by the horrible person, and the scary sight of Leopard tanks rolling down the streets in a reprise of the Tiananmen spectacle. That's as likely as Khaw Boon Wan's "No guarantee PAP will be in govt after polls" headline. That's coming from the same fella who said the town council finance software can be easily bought off the shelf. Last time we looked, there's nothing at Sim Lim Square retailing at $24 million (cost of develpment) or $14,000 (selling price to PAP town councils). Point 2 asks if the opposition camp has any candidate capable of doing us proud in front of an international audience. There is one much maligned person who is Chairman of the Asian Alliance for Reforms and Democracy, and has been engaged by the National Endowment for Democracy. He was also awarded a Hellman/Hammett Writers Grant by Human Rights Watch in recognition of his courage in the face of political persecution in Singapore. 'Nuff said. Point 3 wants to know if alternate voices are able to talk with world leaders and business leaders on equal standing. We assume this refers to experience on the international stage (as in Point 2) and not about having to be paid at least $1 million to garner sufficient self confidence to meet with business leaders. Point 4 is about maintaining good relations with with our "sensitive" neighbours. This coming after Shanmugam, Lim Swee Say, and Lee Hsien Loong's intemperate remarks about Malaysia's education system, their racial policies and Indonesia's haze, respectively. The writer must be living under a rock. Point 5 asks if the alternate voices in parliament truly speak for the people or merely to serve their personal agenda. 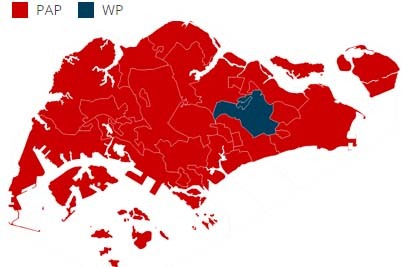 All we know, on record, is that Goh Chok Tong spoke up only once in parliament after GE 2011, and that was in support of the Population White Paper. Point 6 raises a scary thought: "We might have to be foreign workers ourselves." That's exactly what the horrible person predicted: one dose of bad governance, and "our women will become maids in other people’s countries, foreign workers." Point 7 claims markets will react, foreign funds will flee Singapore immediately, our currency will lose its value if if PAP is voted out of the government. There were those who swore Singapore will not survive without the horrible person running the country. 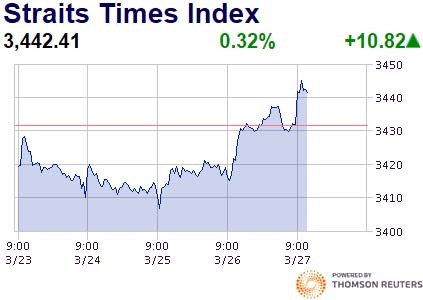 Yet on the day he kicked the bucket the Strait Times Index actually advanced quite a few points. Point 8 reminds us that some candidates only appear every 4-5 years when election comes. 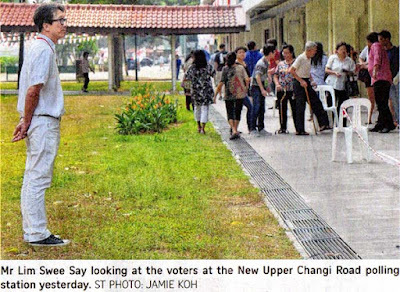 That explains why the son of Punggol is now just reappearing in Ang Mo Kio. Point 9 says nobody like(s) to be the one to give hard truths. Hello, someone wrote a whole book about it. Did the writer read it, or used it as a door stop? Point 10 asks why are countries sending their diplomats to study from a small little red dot. The country who sent the most "students" for the free education is Communist China. Their generals were even treated to expensive tution in English so they can find their way to the little boys' room without having to resort to subtitles. Point 11 is easy - will a weak government fighting for political survival have time for long term projects? The answer is that the weak government is "going to spend all my time thinking what's the right way to fix them, to buy my supporters votes." Point 12 reminds us what really captures the world's attention on Singapore. No, not the F1 night race, not overblown YOG - it's the highest paid salary for a sitting prime minister. Of course, when CNN finally airs the interview with Amos Yee, we will be number one again on the world stage for all the wrong reasons. "Their biggest problem is education because they have not integrated their schools. Politically the Chinese MCA wants to maintain control of the population by having Chinese schools. So they take the Chinese out of the mainstream schools, the kids don't integrate. The Malays are in mainstream schools which are becoming more and more Malay and Islamic, which discourages the Chinese from getting into schools. So from a very early age you keep the Malay and Chinese populations apart, how do you integrate them later?" 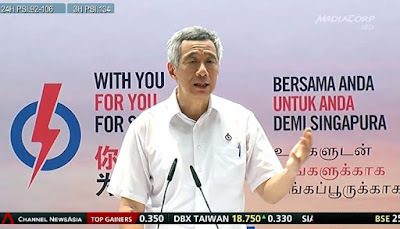 "Then in 1965, Singapore and Malaysia separated, because Mr Lee Kuan Yew wanted a nation regardless of language, regardless of race – one that is equal. So we can’t stay in Malaysia, as the tenet of Malaysia is: Malaysia belongs to the Malays. So we had no choice, we could only separate. So I am thinking, if we didn’t separate in 1965, today you and I would be Malaysians, ‘heng’ (lucky) ah." "Whenever there's haze blowing to us or to Malaysia, somebody in Indonesia will say 'these people are so ungrateful, (for) 11 months we supply them fresh air, never charge for oxygen. One month haze already so unhappy'." "Lim is a minister who behaves like an idiot. Singapore should be embarrassed for having a cabinet minister like him. I understand you want to be patriotic but you do not have to throw insults at your neighbour. It does not bode well (for a nation) to have ministers such as him. If Lim wants to talk about luck, the manpower minister should feel fortunate that there are so many Malaysians working in Singapore and paying taxes to the island republic. Do you not feel lucky about that?" MCA central committee member Datuk Dr Mah Hang Soon added that Mr Lim’s ill remarks were uncalled for especially since both countries have been working toward a better bilateral relationship in recent years. Shanmugam and Lee didn't exactly help in fostering neighbouring ties either. "That's why we have the CPIB reporting to me as PM, and if I don't give approval to the CPIB to investigate somebody, the CPIB can go to the president and ask the president for approval. The president says yes, and the CPIB can proceed, against the PM." The argument would have been more convincing if the president were not related to him by family ties. The captain of the ill-fated Titanic, Captain Edward John Smith, had failed to take proper heed of ice warnings which was transmitted to him. As the most senior of the White Star Line's captains, he thought he knew it all. We now know one of the reasons for the collision was the direct result of steaming into a dangerous area at too high a speed. We also know the Titanic only had enough lifeboats to carry about half of those on board. There were also stark differences in the survival rates of the different classes: although only 3 percent of first-class women were lost, 54 percent of those in third class died. That's what can happen with growth at all costs, overcrowding and ignoring the Gini coefficient. The British inquiry findings warned that "what was a mistake in the case of the Titanic would without doubt be negligence in any similar case in the future". Sylvia Lim's own take is that the ruling party might not be what it was in the past and there is no assurance on the quality of future PAP leaders (or past and present pms).